Originally a Shane's World article, written by Shane himself, this piece has been modified into the "catfish of the month" format and added to slightly in an effort to highlight this particular catfish. The Lima shovelnose is a member of the family Pimelodidae. It belongs to the group of pimelodids known collectively as "shovel noses". Other shovelnoses include the Tiger Shovelnoses (Pseudoplatystoma fasciatum, P. tigrinum and P. coruscans), the Round-head Shovelnose (Sorubimichthys planiceps), and the fabulously patterned and thus priced Brachyplatystoma tigrinus. All members of the family Pimelodidae are found only in the Americas. All are also predators in their natural habitat. 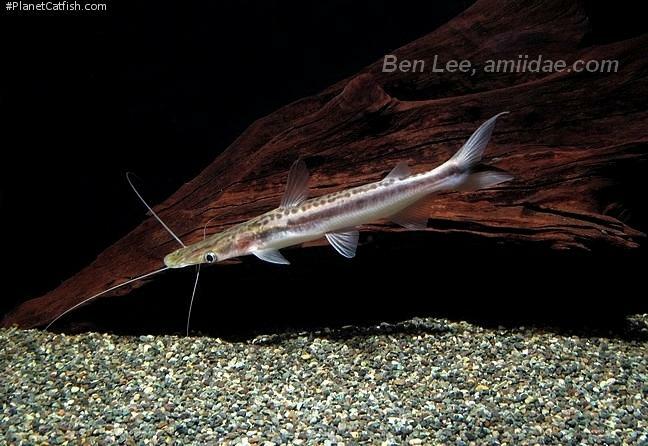 Of all the large predatory catfishes found in the aquarium trade, S. lima is perhaps the best suited to aquarium life. In one way it can be considered the "dwarf shovelnose", although they are capable of reaching a larger size, the majority of tank-raised specimens seem to be fully grown at just over 12 inches. That may not sound like a dwarf, but it is in comparison to a 4 foot tiger shovelnose! A 55 gallon tank would be the minimum size in which this fish would prosper. Water chemistry is not a problem. These fish do well in a wide range of conditions. The most important thing is that the water is kept clean. Good filtration should be combined with weekly water changes of 30% - 40% of the tank's volume. Good but not overly strong current from a power-head will also make them feel more at home. In nature, the Lima shovel nose hides in a head down position next to the roots of large trees. It waits in this manner for unsuspecting prey to wonder by. One nice thing about S. lima is that they can be weaned off of live foods easily. This should be a priority with new acquisitions as feeders often get the final revenge by spreading a disease to their predator. Sinking food tablets are fine for day to day feedng. Large earthworms are also appreciated and will not spread disease. Crickets are also eaten. A 100 gallon tank with 5-6 S. lima would be fascinating to watch and may allow the aquarist to be the first to spawn this wonderful catfish. Type Locality Rio Maranham, Brazil. Etymology Sorubi is the Brazilian local name for this fish (and several other pimelodids), latinised to become Sorubim. This specific epithet literally means "a file" (lima=a file) and refers to its exposed pre-maxillary tooth patch. Size 505mm or 19.9" SL. Find near, nearer or same sized spp. Identification No other pimelodid genus possesses a dark horizontal stripe stretching entire length of head and body. Some fish grow larger (particularly in the wild) than the size given here perhaps indicating a difference between the sexes or a group of species. Distribution Sorubim lima is widely distributed throughout most of South America east of the Andes mountain range, including the Amazon, Orinoco, Paraná and Parnaíba river drainages. It is syntopic with S. elongatus in the Orinoco basin and with S. elongatus and S. maniradii in the upper Amazon drainage of Brazil, Ecuador, Peru, and Bolivia. Other Parameters To best replicate this fish's natural habitat the water should be neutral and soft. Feeding Carnivore that can be trained to accept most foods but patience is often required in this regard. Younger fish are more adaptable to new foods. Furniture Large pieces of driftwood placed so as to form "tree roots". This effect is easily accomplished by attaching suction cups to the driftwood and "sticking" the wood to the back and sides of the tank. Plants will have to be chosen carefully as S. lima will sometimes dig. Compatibility Predatory and thus unsafe with anything small enough to be eaten, but otherwise very peaceful. Suggested Tankmates They are quite sociable as big cats go and it is possible to keep a group of these catfish in one tank. Three Lima shovelnoses would do well as a group in a large enough tank. This is especially true if all three are raised in the same tank together. Other tankmates must be chosen with great care. Large cichlids could be experimented with, but should not be aggressive species. Large plecos and other catfishes would be great tank-mates. Breeding The Lima shovel nose has not been bred in captivity. There is one report that a pair laid eggs in a nest they constructed in the aquarium, but no fry hatched. There are 59 registered keepers, view all "my cats" data.